TORONTO — Johnny Manziel is expected to see the field in his first game as a Montreal Alouette, while Andrew Harris looks to keep his hot streak alive as a busy Week 7 schedule kicks off Thursday night. Montreal is the opening setting of Week 7 in the CFL, where the Edmonton Eskimos come to town for their first meeting of 2018. Edmonton, coming off a bye week, will be aiming for a fourth victory, but is only 1-2 against East Division teams this season. Montreal rapper LOUD will be performing at halftime as part of the Thursday Night Football Concert Series. Kickoff is scheduled for 7:30 p.m. ET. Toronto and Winnipeg will complete their home-and-home series Friday night at Investors Group Field at 8:30 p.m. ET. Andrew Harris will try to extend his streak of 100-plus rushing yard games to four after he ran for 161 yards against the Argonauts at BMO Field. The Argonauts will attempt to bounce back and split their second home and home series against a West Division opponent. To complete Week 7, Saturday features a pair of games. Beginning at 4 p.m. ET the Ottawa REDBLACKS travel to Hamilton to take on the Tiger-Cats. 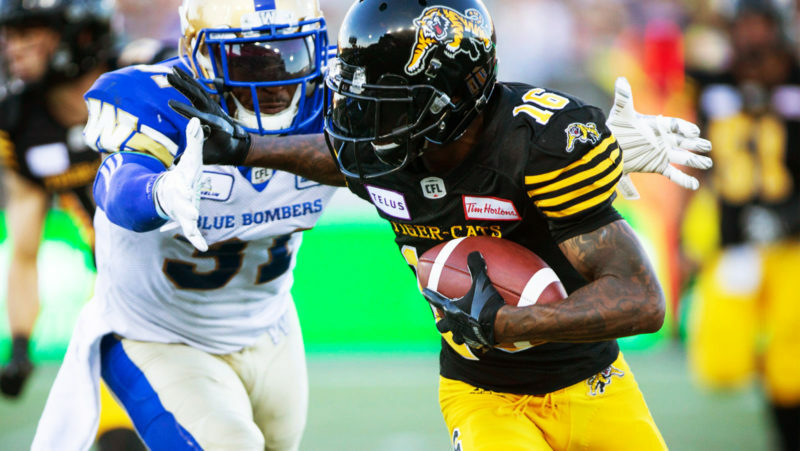 Ottawa will be the first East Division opponent the Tiger-Cats have played this season and a victory will tie them atop the standings. Ottawa had a thrilling comeback victory over BC last week and will search for a two-game lead over Hamilton in the standings. The final game of Week 7 takes us to Saskatchewan where the undefeated Calgary Stampeders bring their 5-0 record to Mosaic Stadium. Saskatchewan enters the game having swept a two-game set with the Tiger-Cats and is now tied for second in the West. The Stampeders are looking to begin the season 6-0 for the first time since 1995. Kickoff is scheduled for 9 p.m. ET. 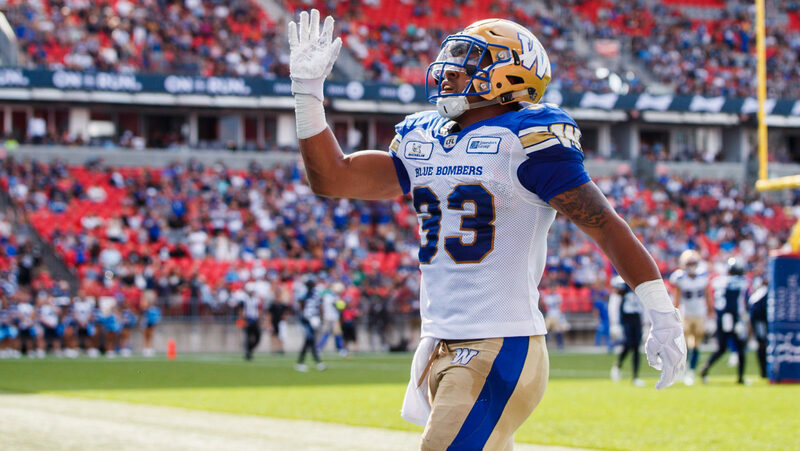 Winnipeg Blue Bombers running back Andrew Harris rushed for 161 yards on 27 carries in last week’s victory over the Toronto Argonauts and scored two touchdowns (1 rush, 1 rec). It marked the third consecutive game that Harris reached 100-plus yards, helping the Bombers go 2-1 in those games. Through the first three games of the season he rushed for 201 total yards (4.2 yards per carry). However, in his last three games he has rushed for 409 yards (7.9 yards per carry) and scored five touchdowns during that stretch (four rush, one rec). The 27 carries he recorded last week is a career-high for Harris as well as the highest this season. The second-most carries in a single game this season is 23, held jointly by William Powell and C.J. Gable. His current pace of 101.7 rushing yards per game has him on pace for a 1,830-yard season and 21 touchdowns. The touchdown pace would place him tied for third all-time after Milt Stegall 23 (2002), Cory Philpot 22 (1995) and Allen Pitts 21 (1994). It would also set a new Canadian mark. Only one Canadian has scored 20-plus touchdowns in a season – Blake Marshall (20) in 1991 with Edmonton. The pace of 1,830 rushing yards would establish a new Canadian record, surpassing Jon Cornish’s record of 1,813 set in 2013. Peterborough, Ont. native and Ottawa REDBLACKS receiver Brad Sinopoli is on pace for 1,692 receiving yards, which would smash his personal best set in 2015 and 2016 (1,036) by 656 yards. Through six weeks Sinopoli is trailing only Duke Williams (556) from Edmonton for the league lead. Sinopoli leads in several key receiving categories: receptions (36), yards after catch (200) and has the league-high 171 yards in a single game this season. Not only is Sinopoli on pace to break his personal best for receiving yards but he is also on pace for seven touchdowns and a whopping 130 receptions, which would be the second most all-time trailing only Derrell Mitchell’s 160. Sinopoli is looking for his fourth consecutive 1,000-plus yard season. With his pair of 100-plus yard games this season he now has nine for his career. If you take away Ottawa’s two games against Calgary Sinopoli is averaging 131 yards a game and nine catches. In Charleston Hughes’ 152 career games in the CFL, Saturday’s game will be his first one against Calgary, the team he played 10 seasons for. In Hughes’ 11th season in the CFL he currently leads the league with six sacks, with 105 in his career. Hughes is now tied for 10th most sacks all time. He is tied with Rodney Harding (105), just five behind Tyrone Jones’ ninth-place 110. Hughes is tied for the most sacks in Stampeders history (99) with Will Johnson and is currently averaging 0.7 sacks per game in his career. He has led the league in sacks three times in his career. Winnipeg linebacker Adam Bighill is 13 tackles away from entering the top-25 all-time defensive tackle list. Marvin Coleman is currently 25th with 538. Coleman did so in 166 games; Bighill will be playing in his 106th this week versus Toronto. Bighill leads the league with 37 tackles, followed by Cambridge, Ont. native Chris Ackie in second with 36 tackles. Bighill is attempting to become the second player in CFL history to record 100-plus tackles in four different years. Visiting teams have a .391 winning percentage (9-14) while home teams sit at .609 (14-9). Bye Weeks: Teams coming off a bye this season are 4-3. Edmonton, who had a Week 6 bye, take on Montreal on Thursday Night. In two starts, Travis Lulay has completed 64 per cent of his passes, passed for 651 yards and has thrown three touchdowns to one interception. His favourite target in those two games, Emmanuel Arceneaux, has 12 catches for 215 yards since Lulay was named starter. 52 per cent of games this season have been decided in the final three minutes. This week Hamilton added Chris Williams via trade. Williams owns the highest average per catch this season with 18.9 per reception and is tied for the most 30-plus yard receptions. His new quarterback Jeremiah Masoli (along with Bo Levi Mitchell) has attempted the most 20-plus yard passes. Both have attempted 37 of those passes each. Terry Baker, Doug Flutie, Andre Ware, and Troy Smith are quarterbacks who have won the Heisman Trophy and started a game in the CFL. Eric Crouch won the Heisman in 2001 and played for Toronto but did not start. Johnny Manziel is hoping to become the fifth Heisman Trophy winner to start in the CFL. Six of nine teams have two or more wins. Calgary is off to its first 5-0 starts since 1995. That season the Stampeders began 7-0 with Doug Flutie as QB. They lost Flutie due to an injury; however, Jeff Garcia took over the helm and led the team to 15-3 record. Calgary is plus-13 when it comes to the turnover ratio, on pace for plus-47 which would set a new CFL and club record. The CFL Record is plus-41 set by Edmonton in 1981. The Calgary club record is plus-27 in 1996. Christion Jones has four kick return touchdowns in 17 career games (regular season and playoffs). That’s a ratio of one in every 4.25 games. By comparison, Gizmo Williams’ ratio was one in every 6.4 games.